The Seewand via ferrata is aimed at expert climbers that seeking for challenging climbs! If you are not experienced, we recommend a climbing guide from Outdoor Leadership! Starting point for the climbing tour is the parking at the Kessel bathing place between Hallstatt and Obertraun. The access to the via ferrata leads via the Hirschaualm (approx. 30 minutes). You should plan around 4-5 hours to complete the Seewand via ferrata. 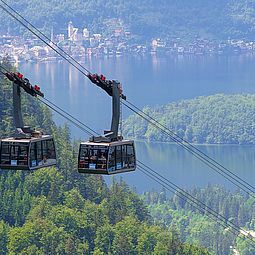 During the climb you can enjoy panoramic views of Hallstatt and the Inner Salzkammergut. 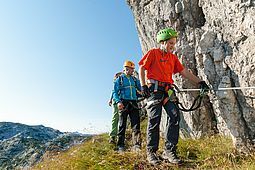 The exit of the via ferrata Seewand is on the Dachstein mountain plateau where you reach the Gjaidalm after around 30 minutes via a beautiful Alpine trail with magnificent Dachstein views. From there you have the possibility to take the Dachstein Krippenstein cable car into the valley. Completing the descent on foot takes an additional 2 hours (either via the ski descent or from Schafeck/Hanzingerhütte via Winkler mountain). Duration: 6 to 9 hours, depends on fitness level! The Seewand via ferrata has been built by the Tourist board Obertraun in collaboration with Heli Putz / Outdoor Leadership.